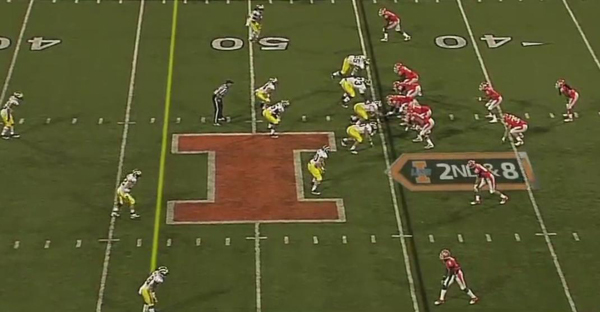 Though Michigan showed a lot of innovative blitzes against Illinois, perhaps the most memorable play from the game was one of the few times the Illini ran from their signature pistol formation. The most highlight-worthy moment of the play was Jake Ryan flattening Illinois quarterback Nathan Scheelhaase a moment after he pitched the ball, but it was the play of Jordan Kovacs (shock) that really made the defense effective. Illinois comes out in the pistol formation they're known for. Michigan counters with a basic 4-3 under formation. 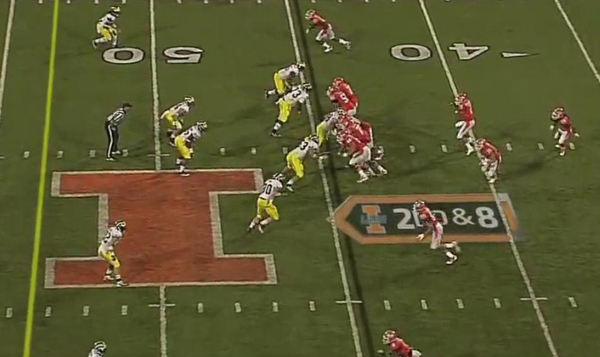 Instead of running the triple option as Illinois typically does from their formation, they run a speed option to Scheelhaase's left with the H-back used as a lead blocker. A moment later, Ryan has beaten the block from the slot receiver. 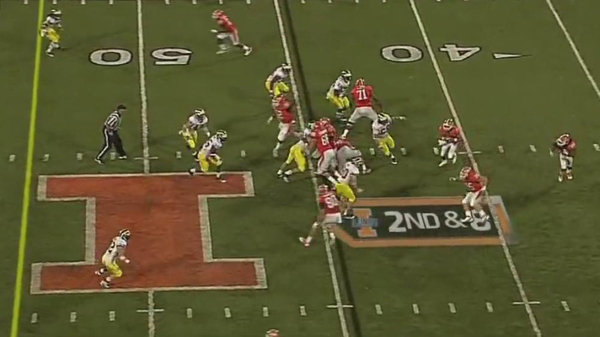 Illinois' H-back (acting as a lead blocker) recognizes this and tries to slow up and block Ryan but is unable to. This play is intended to option off of Kovacs, but because Ryan is in the backfield so quickly, Scheelhaase is forced to pitch the ball too early. Despite the H-back trying to block Ryan, he's still able to hammer Scheelhaase who pitches the ball. 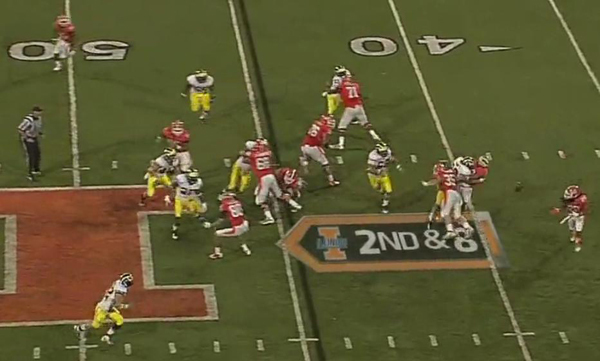 At this point, the running back is essentially in space against Kovacs. Martin is flowing to the play in pursuit but is initially outrun. This is where Kovacs makes the play. Illinois' running back is trying to get to the edge of the field and away from Martin and Michigan's other pursuit defenders. As you can see, Kovacs is coming downhill at the ball carrier but he's a yard or two outside of the ball, making sure to funnel the play back inside. As Kovacs approaches the ball carrier, he's still aligned with the outside shoulder of the running back, forcing him back inside. Though it looks like Kovacs overruns the play (he doesn't, as we'll see), that's OK because he's forcing it back to the middle where his help defense is. Kovacs reaches out and gets a hold of the ball carrier, slowing him enough for Martin to wrap up the tackle. 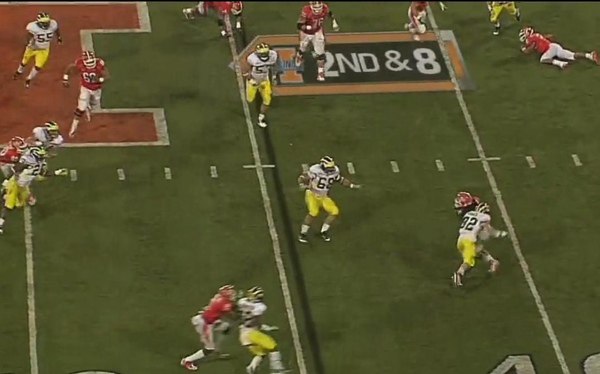 If Michigan fails to do any of these things (Ryan's jump, Kovacs' contain, or Martin's pursuit), this could have become anything from a 5-yard gain to a long touchdown. 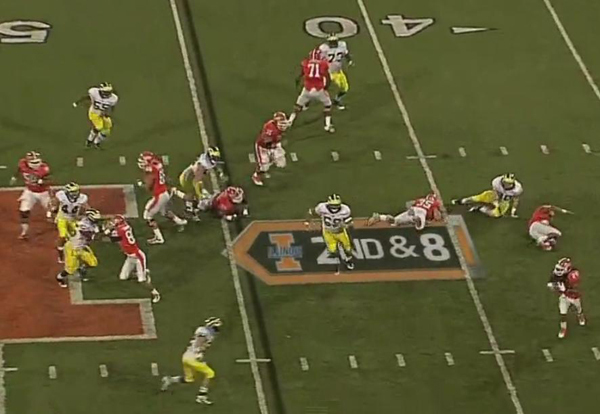 But the combination of these actions helps Michigan perfectly execute the play. Ryan's ability to force the pitch early simplifies Kovacs' read. Given that Mattison has assigned Michigan's defensive ends to play the quarterback on option runs, I'd bet Ryan was coached to go directly after Scheelhaase if Illinois runs from this formation. Kovacs is the real key, in my opinion. For the last three years, we've been treated to corners/safties/linebackers giving up the edge as they rush without abandon to try and make the tackle. Kovacs is smart enough to realize that he's in space against a running back and will probably struggle to make a play. He shows the perfect amount of aggressiveness here: engaging the running back in the backfield, but being cautious enough to maintain leverage. Martin is able to clean up the play because of his pursuit. It helps that he ripped through Illinois' suspect offensive line, but good defenses have players that make plays like this. Martin was heads-up enough to read the play and get himself in position to corral the running back if Kovacs kept contain. For this blog's purposes, the schemes that Mattison brings are probably the most exciting aspect of the new coaching staff, but in reality, proper positioning and this kind of fundamentally sound play is the real benefit of Mattison and Co. Chances are that last year, this play goes for a significant chunk of yardage and the team continues to make the same basic errors. In the span of one season, Michigan's defense suddenly gets it. That's all coaching. I hate you Greg Robinson. p.s. I hate you Rich Rodriguez. I miss the spread offense. I miss putting 67 points on the #12 ranked Illinois defense. I guess I miss Rich Rod. I miss RR's playcalling and offensive mind. I certainly don't miss his hiring skills. Based on what we saw, he should really be an OC, not an HC. 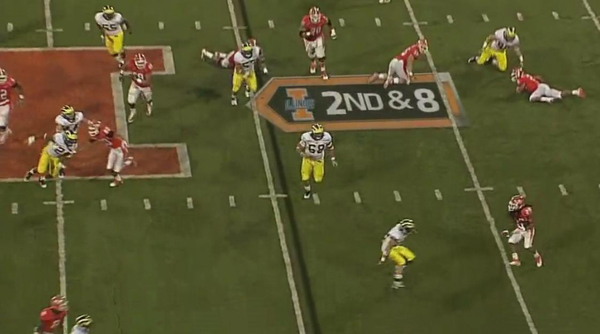 Should Hoke have gone for two?